With Field Classifications you can fine-tune access and visibility of custom fields by marking fields containing personal or sensitive data. Additionally, you can use this screen to view the classification level for standard data object fields in Coresystems FSM . ATTENTION: To perform actions within the FSM Applications a User must have at least PUBLIC/INTERNAL/CONFIDENTIAL assigned. 1 Custom Field field classifications can be adjusted. 2 For all standard fields there is a defined classification setting that can also be adjusted as needed. 3 In the field configuration / UDFMeta there is a property for classification which is set for each field. 4 When a new field is added to the system the default classification INTERNAL is applied. 5 A user group can be assigned to one or more classification types. 6 A user can access all fields matching the classification types selected within his user group. 7 A user has access to these fields within all coresystems modules (WFM, MDM, …). 9 All default users of coresystems FSM must have access to CONFIDENTIAL, INTERNAL and PUBLIC in order to do their work. 10 If a field is classified as CONFIDENTIAL and the user group to which the user is assigned has no access to this classification, an empty/null value will be returned stating the field has no access to this classification, an error message will be returned, and the value will not be written. 11 Within the mobile app, the classification is applied on every sync. 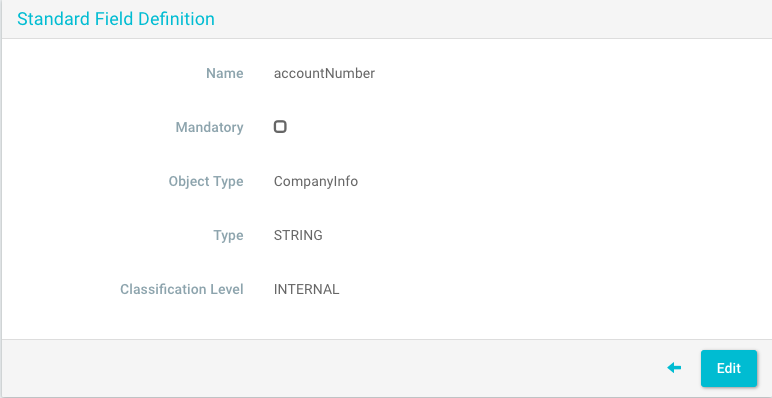 The Standard Field Definitions screen is access at Admin > Company > Custom Objects > Standard Field Definitions. These field classifications for custom objects are company-specific. That means if you have an account with multiple companies, fields classifications will also have to be edited where applicable for the other custom objects/fields shared with these companies. The list view contains all fields contained in the Coresystem FSM applications. 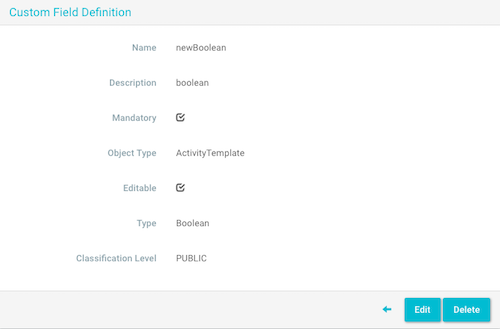 Here, you can view and modify the field classifications for standard DTO fields. Name The name of the field contained in the DTO. Mandatory When active, the field is mandatory. Object The data object (DTO) with which the field is associated. Type The type of data associated with the field. Options include: boolean; datetime; array; enum; integer; float; string. By selecting a standard field definition, you can view and adjust the field classification level. Mandatory Read-only. When active, the field is mandatory. Object Type Read-only. The data object with which the field is associated. Type Read-only. The data type associated with the field. Classification Level* Required. The classifcation level associated with the field. For more information on classification level types, refer to the Classification Level Types section. Internal The data contained in the field is for internal-use only. Restricted The data contained in the field contained sensitive personal data. Confidential The data contained in the field contains personal data. Public The data contained in the field is public. Custom fields that have been defined can then be reutilized in another custom data object. When a custom field is updated, all instances where the custom field is referenced will also be updated. Name The name of the property of the custom object. Description A description of the custom object/field. For internal purposes only. Mandatory On or Off. When On, the property will be mandatory. Type Required. When adding an additional field (property) to a custom data object, you will be able to select a data type. Options include: boolean; date; date time; integer; float; string; time; referenced object. For more information, refer to the Custom Fields. Editable Yes or no. By selecting No the custom field will no longer be editable. If the custom field has already been defined, this link will appear. By clicking on the link, the application will redirect you to the custom field definition view. If you edit the custom field definition here, it will udpdate all instances where the custom field is referenced. Classification Level Required. The classifcation level associated with the field. For more information on classification level types, refer to the Classification Level Types section.